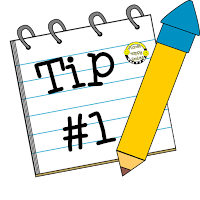 We are going to start sharing some tips that will help with either organization or classroom management over the next few weeks! We hope that you find something that you can use in your classroom!!! Here is our first tip and it has a FREEBIE included! You know how kiddos carry germs and tend to share with others. Then several kids in your class get sick. Well ... we use this little tool to combat those germs. 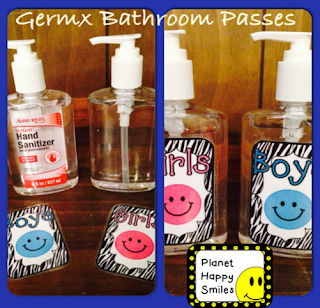 I have been using them for a few years and my kiddos have not gotten sick as often. It seems to be working! 1st- Buy the Hand Sanitizer you like and peel the labels off. 2nd- Print the labels you want to use in your room. 3rd- Place them in a spot for the kiddos to go and grab them. Now, you are ready for action! 1st- The kiddo who needs to use the restroom goes and grabs it from it's "home". 2nd- He/she places the bottle on his/her own table/desk. 3rd- They go to the restroom. 4th- They return, squirt their hands, and return the bottle. I love it!!! The kiddos do, too! I ran out often which is one way to know they are using the hand sanitizer. I hope this helps you have a germ free class (as much as you can) next year! This was made during my plane ride to and from Vegas with all of our Facebook and blog followers in mind! 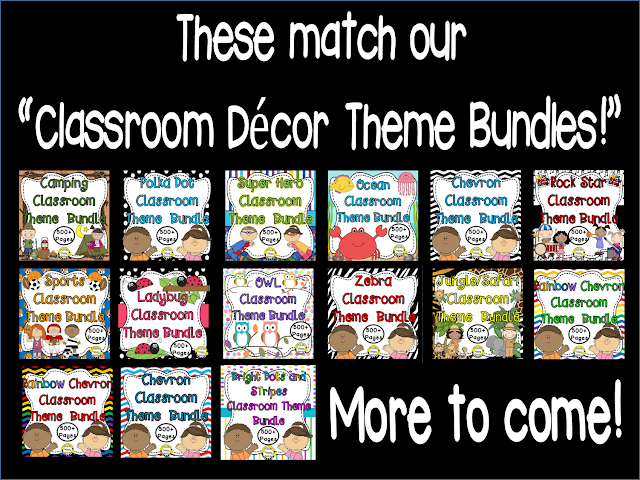 If you have purchased one of our bundles or any decor item from our store. These will coordinate with the items you already have! Click on the picture below and go grab your labels! You can make them and have them ready for your Monday Made It!! !